Electra Dyne Head, Tube Guitar Amp Head from Mesa Boogie in the Electra Dyne series. 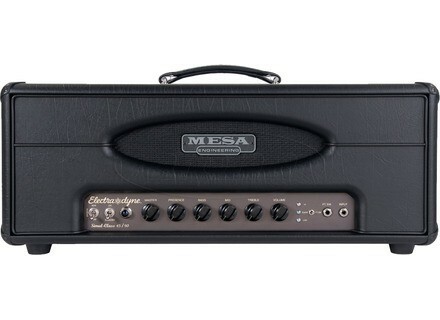 Mesa Boogie introduces the Electradyne, a new amplifier line with six knobs and a switch. According to Mesa Boogie, the Electradyne takes modified English gain sounds and sorts them into LO and HIGH regions. These two choices are combined with a retro-minded, American-voiced clean “channel” and linked to one mini-toggle that gives you three of the most classic sounds in Rock and Roll on one switch. Footswitchable modes and the tuned control interface allow many players to stomp back and forth across the pond without touching a single control. Choose between the Simul-Class quartet of 6L6 for 90 watts, or switch down to the pair for a 45 watts. You can also load the Electradyne with EL34 type tubes for a brighter Brit style clip thanks to the switchable Bias Select. Pricing: 1599$ for the head version, 1699$ for the combo 1x12 version, and 1799$ for the 2x12 version. For more info and full product specs: www.mesaboogie.com. [NAMM] Mesa Boogie Mark V Mesa Boogie has released its new Mark V to celebrate the product's 40th anniversary. [NAMM] Eric Johnson Stratocaster RW Fender introduced the new Eric Johnson Stratocaster RW model. [NAMM] Dave Murray Stratocaster Guitarist Dave Murray of Iron Maiden has joined forces with Fender to create a signature model based on his own ’57 Stratocaster, previously owned by late, great Free guitarist Paul Kossoff.